The Chicago Bears worked feverishly to start the 2018 offseason, acquiring weapons for second-year quarterback Mitchell Trubisky. They signed former Jaguars WR Allen Robinson, who led the league in deep receiving yards just three seasons ago before injury sidelined him for 2017 after three snaps. 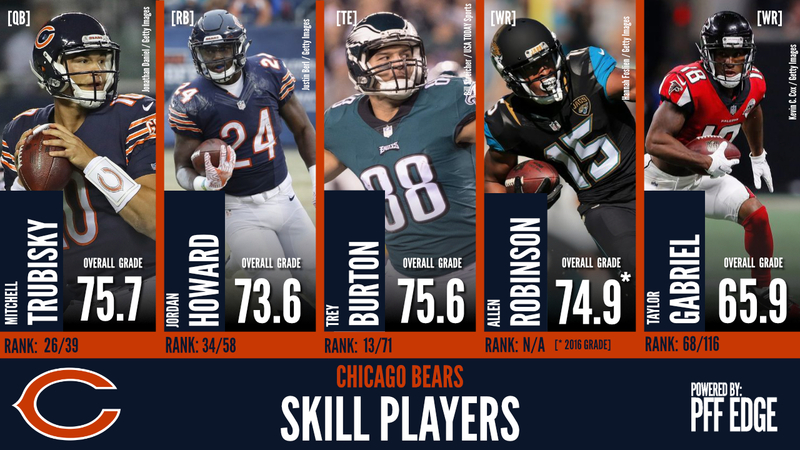 Additionally, they added former Falcons WR Taylor Gabriel and Eagles TE Trey Burton, making the list of PFF’s top upgraded units through the free agency period. On defense, the Bears brought back both cornerbacks Kyle Fuller and Prince Amukamara who each played vital roles in the secondary a season ago while they added edge rusher Aaron Lynch from San Francisco, who has flashed some brilliance early in his career. While there are still holes on the Chicago roster moving towards the draft, Senior Analysts Steve Palazzolo and Sam Monson examine what they think of each move for the Bears so far.